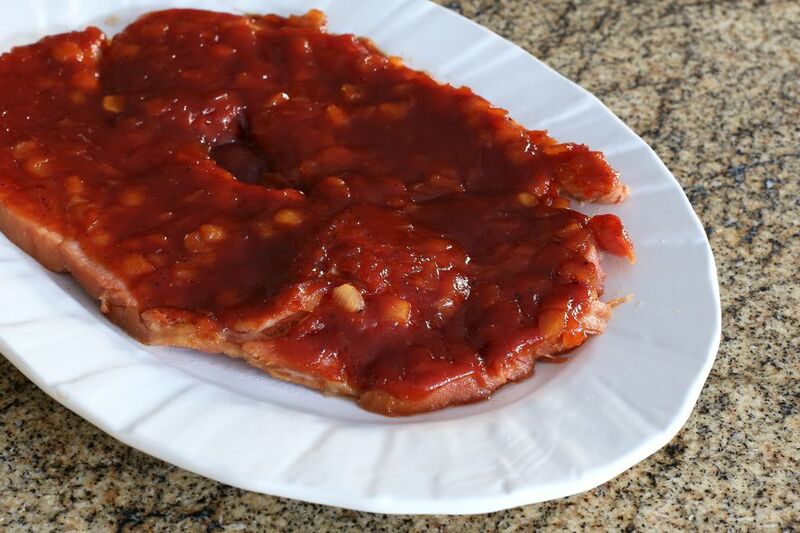 This ham steak is baked with a flavorful homemade barbecue sauce. The sauce takes about 5 to 10 minutes to make, and then the ham slice is baked to perfection in the oven. The flavors are excellent with baked beans or serve the ham with baked, mashed, or sweet potatoes. Corn is another good side dish option, or serve it with your family's favorite vegetable sides. Line a rimmed baking pan with foil. Spray lightly with nonstick cooking spray. Place the ham in the prepared baking pan. In a saucepan over medium-low heat, melt the butter; add the chopped onion. Saute the onion until translucent. Add the ketchup, water, brown sugar, vinegar, Worcestershire sauce, salt, and pepper. Stir to blend and cook for about 1 to 2 minutes, or until hot. Pour the sauce over the ham. This recipe calls for a large ham steak. If you can't find a ham steak, use about 8 ounces of thick leftover or store-bought ham slices. Sauté about 1/4 cup of diced green bell pepper along with the onion. Place the ham in the prepared baking pan and then top the ham with pineapple slices or drained chunks; pour the hot barbecue sauce over the ham and pineapple and bake as directed.